This is a popular USB to UART converter IC. They are on many popular product (i.e. Arduino and many more). This is a 28-pin SSOP package version. It can be soldered by hand or you can get an assembled breakout board here. • Single chip USB to asynchronous serial data transfer interface. • Entire USB protocol handled on the chip. No USB specific firmware programming required. 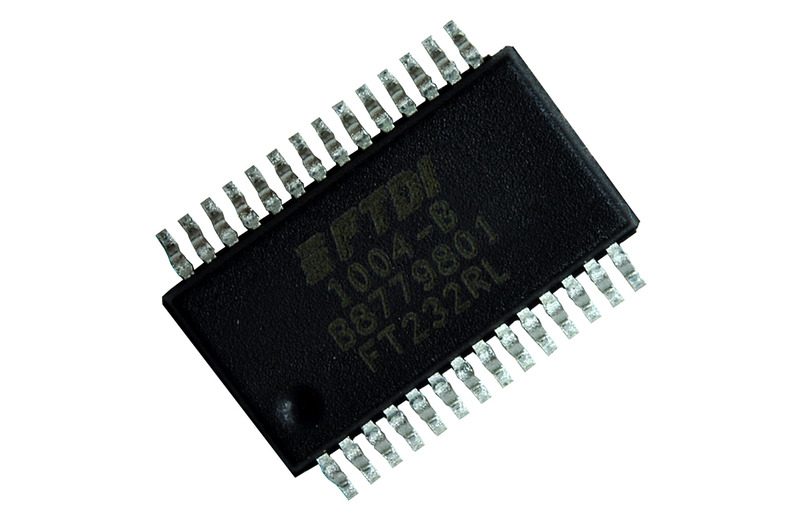 • Fully integrated 1024 bit EEPROM storing device descriptors and CBUS I/O configuration. • Fully integrated USB termination resistors. • Fully integrated clock generation with no external crystal required plus optional clock output selection enabling a glue-less interface to external MCU or FPGA. • Data transfer rates from 300 baud to 3 Mbaud (RS422, RS485, RS232 ) at TTL levels. • 128 byte receive buffer and 256 byte transmit buffer utilising buffer smoothing technology to allow for high data throughput. • FTDI‟s royalty-free Virtual Com Port (VCP) and Direct (D2XX) drivers eliminate the requirement for USB driver development in most cases. • Configurable CBUS I/O pins. • Transmit and receive LED drive signals. • UART interface support for 7 or 8 data bits, 1 or 2 stop bits and odd / even / mark / space / no parity • FIFO receive and transmit buffers for high data throughput. • Synchronous and asynchronous bit bang interface options with RD# and WR# strobes. • Device supplied pre-programmed with unique USB serial number. • Supports bus powered, self powered and high-power bus powered USB configurations. • Integrated +3.3V level converter for USB I/O. • Integrated level converter on UART and CBUS for interfacing to between +1.8V and +5V logic. • True 5V/3.3V/2.8V/1.8V CMOS drive output and TTL input. • Configurable I/O pin output drive strength. • Fully integrated AVCC supply filtering - no external filtering required. • UART signal inversion option. • +3.3V (using external oscillator) to +5.25V (internal oscillator) Single Supply Operation. • Low operating and USB suspend current. • UHCI/OHCI/EHCI host controller compatible. • USB 2.0 Full Speed compatible. • -40°C to 85°C extended operating temperature range.